Ticket to Ride is one of our all time favorite games and Ticket to Ride: First Journey is taking strides to make it a much more accessible game for the whole family. Ticket to Ride: First Journey takes the formula of its predecessor and strips out several of the more complex concepts in favor of a streamlined experience that can be played by kids who are even younger! 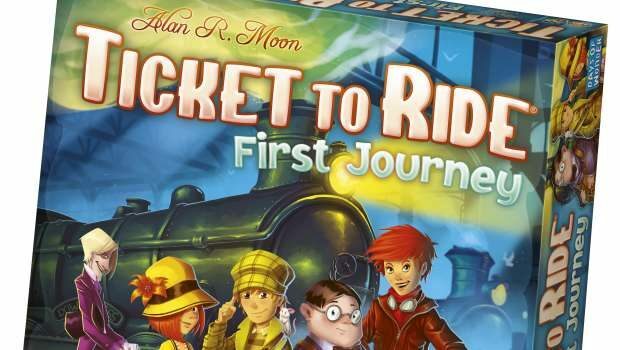 We have always said that the Ticket to Ride series was accessible to savvy kids, but this new version is even better. Gameplay is very straightforward. On their turn a player can either draw two cards off the train deck OR claim a route using the same basic rules as TTR. The main thing missing here is the lineup of trains that all of the players can see. You don’t have to make any real decisions here. If you need more cards; you draw. The map is simplified also. The game board is large, and the various cities are not only larger and more defined, but each of them has an image associated with it that is colorfully illustrated on the board. New York City, for example, has The Statue of LIberty, whereas Dallas has the Lonestar. This makes the game playable even by early readers who might not know how to read Albuquerque. The train game pieces have been upgraded as well. They are much larger (almost twice as big) and are much easier to hold onto. This means that younger kids with undeveloped fine motor skills can still play the game without real issue. Instead of keeping track of points, the game revolves around earning tickets for completed routes. The first person to finish six routes is declared the winner. This encourages efficiency without forcing players to get into the weeds with counting trains and trying to use longer paths. My favorite feature of this game isn’t really any of the simplifications. I really appreciate the fact that this game teaches players the general flow of a game of Ticket to Ride without the burden of some of the finer details of the senior game. Yes. Absolutely. There is nothing in this game from a content perspective that should give parents any pause whatsoever. Yes. This game is designed for younger children than even the original game is designed for. It may not quite be toddler ready, but that doesn’t mean it won’t find value in homes with younger kids. We have enjoyed the time we spent with the game so far and feel very strongly that your family will love this game too. This is especially true if your family contains younger kids who want to play Ticket To Ride, but just don’t quite have the game experience to make it work yet. Nana loves it, too!! Fun to play with everyone! You still play trains on the board, so what’s missing? That should read “train cards.” One of the main ways that this game differs from the “grown up” version is that players only draw cards off the top of the deck. There is no lineup of visible cards to choose from. yes, my family’s kid is going through it in all day.